Women leaders reinforce value of the participation of women in decision-making processes related to climate change. 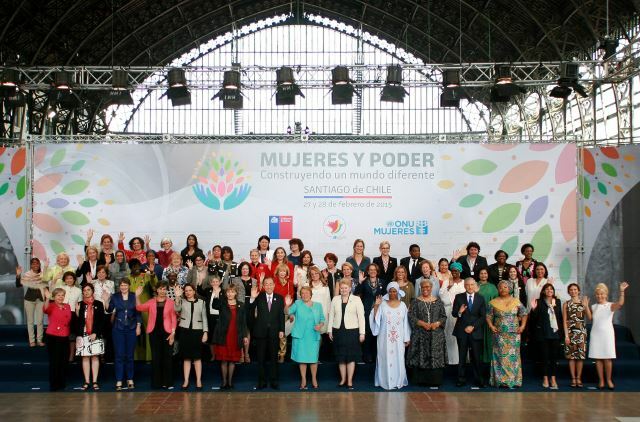 “Women and Power: Building a Different World”, co-hosted by President Michelle Bachelet and Phumzile Mlambo-Ngcuka, Executive Director of UN Women, in Santiago, Chile, concluded with international women leaders signing a call to action titled “Women Leaders: Time to step it up for gender equality”. The call to action, which refers to the 20 year review of the implementation of the Beijing Platform for Action, recognizes the need to involve women in decision-making processes relating to climate change, and for women to design and implement gender-responsive climate solutions. International women leaders, including Heads of State, Former Heads of State, representatives from the UN system, governments, the private sector, activists and a Nobel Laureate,who attended the Women and Power conference repeatedly highlighted the need for women’s empowerment and participation, while pointing out that global agendas and processes like the Post-2015 Development Agenda, Sustainable Development Goals, Financing for Development, and a climate change agreement will not be efficiently addressed, and that global change will not be affected, unless women are around the table.